In a plan that makes sense somewhere in our brains but no where on paper, the one room in the house we have a crystal clear vision for is not the first room we’re planning to renovate. In fact, I don’t even think it’s in the top 3. Mostly it’s because the room in question is our dining room and, after scoring that great dining set, pretty much works as it is while other rooms are crying out for help. 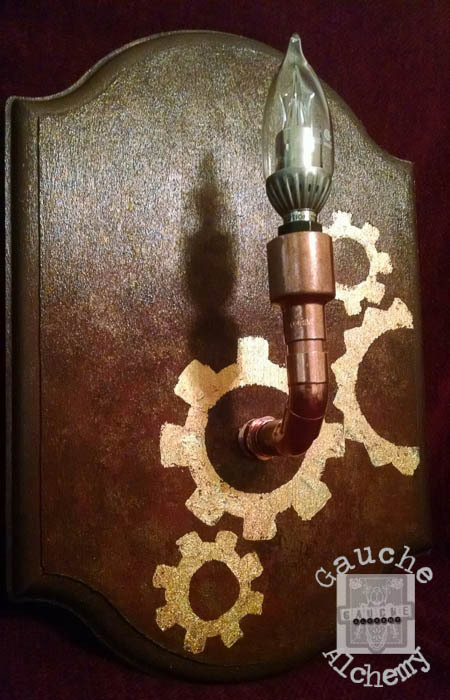 Still, when the November challenge for Gauche Alchemy was unveiled, my mind went straight to our traditional dining decor meets steampunk awesomeness plan and created a pair of copper-gilded sconces that will wait patiently for the rest of the room to catch up! To see how everything came together, make sure to check out my post over on Gauche Alchemy today. And then, if you want to make your own set, read below for what you need. It helps if you have some basic electrical know-how–I left those bits up to Todd since he’s better at it than I am. One thing you do want to be extra careful about with a project like this is not to let any exposed wires from the lamp housing come into contact with the copper pipes and fittings. That would be bad. That’s also, Todd tells me, the reason we used 2 45-degree joints instead of a single 90-degree elbow, to put less potential strain on the wires. While it’s a shame the sconces will have to wait to be hung (we plan to hard-wire them into a dimmer switch when we update the room) it’s nice to have something tangible to guide our choices as we find fixtures for the room over time. A lot of designers zero-in on a key fabric or pattern. I guess this in our key piece!